I caught a few more minutes to make a card on the busiest day of the week in our household...yeah me!! I used Heathers printable to make a name day card. It's a celebration that's very common in orthodox Christian faiths. It's a celebration of the feast day of the saint you were named after. Back in the old days in the village, seldom did anyone remember the date you were born ( hence no b-day's) but they knew when the feast days were so you got to have a celebration at least. History lesson over lol! Back to the card, oh my gosh I'm in love!! I would buy this stamp in an instant! 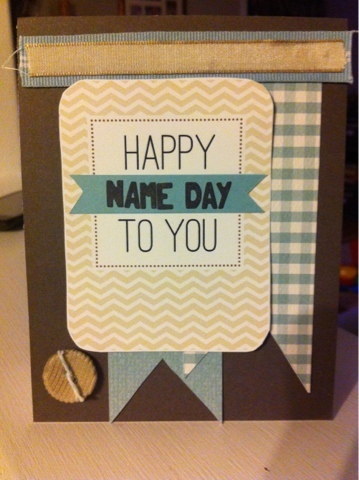 I love how you changed up the card to suit the name day occasion! Very clever! And I agree-- I'd love a stamp set like this!